I hope you're all suitably stuffed, rested and loved. I'm enjoying Day 2 of a stringent napping and snacking regime, interrupted only by a leisurely stroll to the pub. 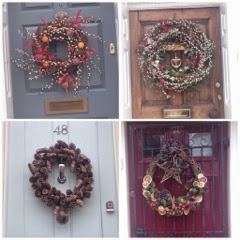 We spied an excellent collection of wreaths en route! At the checkout for 25% off all orders including sale items,must end 1st Jan.